Sprinkle steak liberally with salt and pepper onto both sides. If you are using a skirt steak, only sprinkle pepper as they are very salty. Set up your immersion circulator (such as Anova, Joule, etc.) in a pot of water and follow the steps listed on the app. It will tell you what tempurtaure and how long to cook the steak, depending on the cut, weight, size of your meat and how cooked you want it. I recommend medium­ rare! Place your steak into a gallon-size freezer Ziploc bag and add rosemary springs on each side of the steak. Seal all but one corner of the bag. Slowly lower it into the water bath, until you reach the zipline. You will see all the air being forced out of the pouch. Seal the rest of the bag. Make sure the meat is completely underwater and then fold the bag over the side of the pot and clip in place. I like to seal the food before the water has heated up, because then you can still place your hands in the water to make sure the meat is completely immersed. Once the amount of time your immersion circulator has recommended is up, remove the steak from the bag and place onto paper towels. Blot both sides well; you want it to be as dry as possible. Season with a little bit more salt and pepper on both sides. Heat up a cast iron grill pan until it is screaming hot. Your hand should not be able to be above it for more then a second. Pour in a little canola oil, or any oil with a high smoke point. Place the meat onto the hot pan and press down with tongs, but do not move the steak! Count to 30 and then flip over and repeat until you have a nice sear (crust) on both sides. That's it! Cut your steak and see the difference! You will never want a steak that hasn't been sous vide again! Place the potatoes into a pot and cover with water. Sprinkle a little salt over. Place the pot on a high flame and bring to a boil. Lower the flame to a simmer and simmer for 30 minutes, or until the potatoes are easily pierced with a fork. Drain the potatoes and place back in the pot over a small flame. Dry out the potatoes for 3­–5 minutes, then smash. Add in the stock, butter, sour cream and seasonings. Mix well and adjust salt and pepper. Turn off the flame. Smash the peppercorns using the edge of a plate until mostly crushed. In a saucepan, heat up olive oil over a medium flame. Add in the onions and peppercorn and sauté until golden. Add in the mushrooms and sauté until reduced. Hold the pot away from the flame, add in the bourbon, and using a long lighter light the alcohol until flames appear. (Skip this step if making for Passover.) Allow the flames to disappear and then add in the red wine. Simmer until reduced and then add in the veggie stock. Simmer for 10 minutes and add in the butter. Stir until mixed and serve over steak, mashed potatoes, and salad. This recipe originally appeared on Joodie the Foodie. 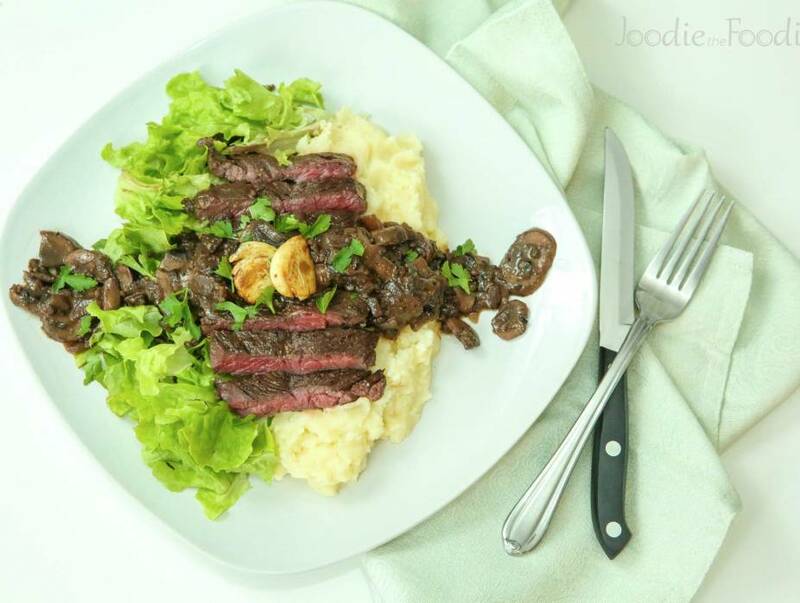 Visit joodiethefoodie.com for more fresh perspectives on classic dishes.